Aw … shucks. I’m Versatile! 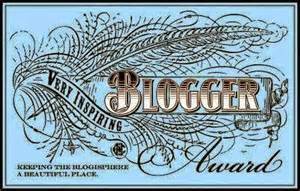 I just found out I’ve been nominated (and thus, awarded), the lovely Versatile Blogger Award. Thank you so much to the blogger who recognized me, average childhood. I have a tattoo of a little alien on my hip. I’ve wanted to be a doctor since I was 13. I believe in little green men (see #1 above). I love cats; I admire their independence. My favourite music is Trance/Techno; DJ Tiesto is ‘da bomb! My husband stays home to raise our kids and I’m in constant awe of him. I love disaster movies, i.e. 2012, The Day After Tomorrow, Knowing; the best disaster movie is the one where the Earth blows up! And here are my nominations for the Versatile Blogger Award. I am pretty new to this, so I could only come up with 10. I have no idea how I’d find the time to following 15! Thanks again to all the folks out there following along! I always knew you were awesome! Aw, thanks Erin. Means a lot! Woo hoo! Congrats! I always enjoy reading your posts, glad you are formally recognized!